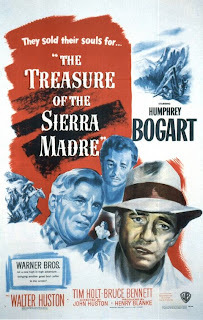 Tag line: "Storming to a New High in High Adventure"
Despite the fact that Studio Chief Jack Warner was against the idea, John Huston shot the bulk of his 1948 film, The Treasure of the Sierra Madre, on-location in Mexico, a country the director had once called home (Huston lived there for two years, during which time he rode with the Mexican Cavalry). Moving the production south of the border proved a stroke of genius, the first of many that would help make The Treasure of the Sierra Madre a full-fledged Hollywood classic. Times are tough for Fred C. Dobbs (Humphrey Bogart) and Bob Curtin (Tim Holt), a couple of Americans trying to make a go of things in Mexico. One day, they meet Howard (Walter Huston), a grizzled old prospector who tells them about his experiences searching for gold. So, the two pals buy as much equipment as they can afford and set off into the mountains, hoping to strike it rich. With Howard as their guide, Dobbs and Curtin do, indeed, find gold, but will petty jealousies and greed get the better of them before they have a chance to enjoy it? The Treasure of the Sierra Madre has it all. First and foremost, it’s a rousing adventure, with the three main characters facing a number of dangers in their quest for riches, including Mexican bandits (during a face-off with one particular group, the gang’s leader, played by Alfonso Bedoya, tries to fool Dobbs and the others by claiming he and his men are part of the Mexican Mounted Police force. Dobbs then asks to see their badges, leading to the film’s most famous line: “Badges? We ain't got no badges. We don't need no badges. I don't have to show you any stinking badges!”). Huston’s direction is also top-notch, building plenty of suspense as Dobbs, convinced that his partners are out to steal his share of the gold, slowly loses his mind, and the picturesque, occasionally treacherous Mexican landscape adds a sense of gritty realism. As for the cast, Huston’s decision to have his father, Walter, play the aging prospector was spot-on, with the elder Huston’s boisterous performance earning him his only Academy Award (for Best Supporting Actor). As for Bogart, he’s sensational as Dobbs, taking what had been a somewhat likable vagrant and transforming him into a ruthless killer. Part adventure movie and part morality tale (effectively warning about the corrosive effect of greed), The Treasure of the Sierra Madre certainly ranks as one of the best films to emerge from Hollywood in the 1940s, and, arguably, is also one of the greatest ever made.